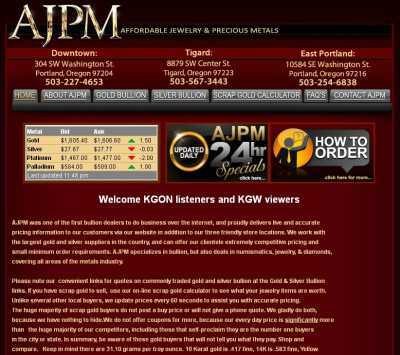 Based on Oregon, Affordable Jewelry & Precious Metals is a bullion dealer that also buys and sells jewelry and diamonds. The company was actually one of the first to provide valuation services over the Internet, and it prides itself on its competitive pricing and small minimum order requirements. And you can see how true that is for yourself by visiting its website. 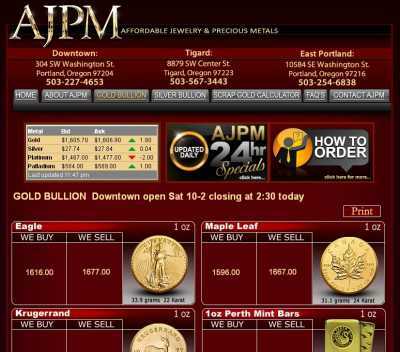 It’s found at AJPM.com, and the prices you can see on its pages are updated every 60 seconds, so as to provide you with nothing but the fairest price for your gold and silver bullion. 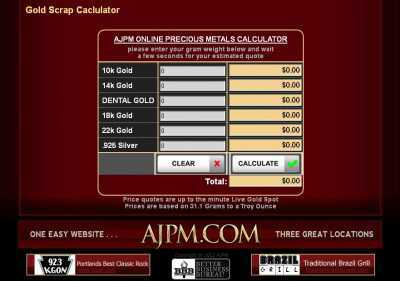 And if you want to sell some jewelry, then you’ll be able to use an online scrap gold calculator that will let you realize exactly how much your jewels are worth. Which is all-the-more important if what you want to sell are some rings or bracelets that belonged to your grandparents (not an uncommon story in these days of financial turmoil, sadly). As you can see, all you have to do is to input your gram weight for a quote to be produced. And if you live in Oregon, you can also visit any of the three Affordable Jewelry & Precious Metals stores in person. One is located in downtown Portland, other is found in East Portland, and the final one is in Tigard, on SW Center Street.